News upon certain game, publisher, designer, community, convention. Nope, I did not go to Japan. It was my girlfriend who visited Japan last week with her mom. So when she visited Japan, I asked her to get me some original Japanese games. 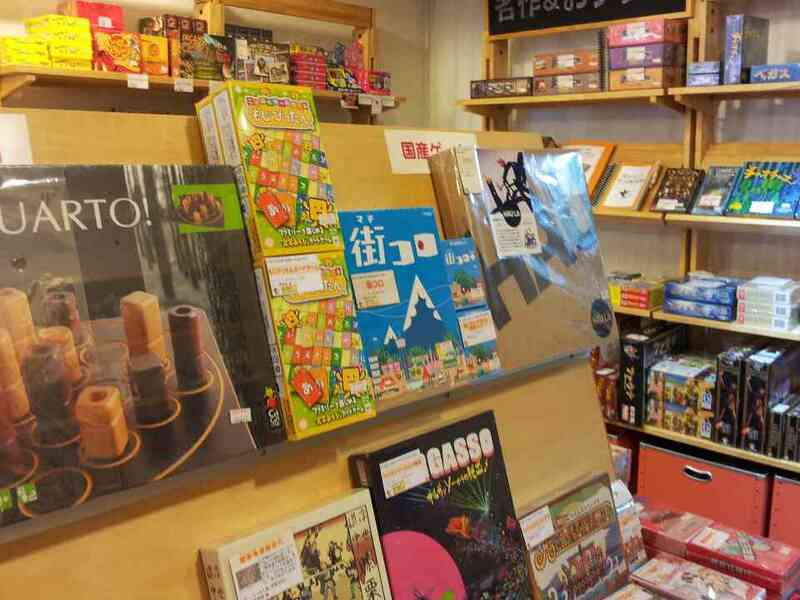 The reason was simple, board games in Japan has recently growth in such awesome rate, the popularity and the trends are hitting Japan in both sides. There are many various Japanese game designers and also community and publishers that take this hobby into serious business and passion. So getting some original Japanese games has it’s own values. 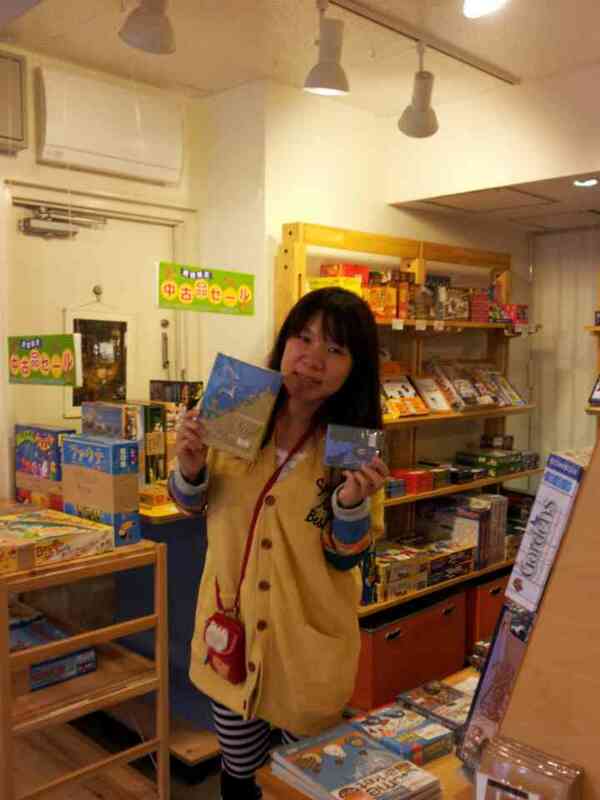 Since she’s visiting Tokyo, I asked her to drop by Sugorokuya (a board game store in Tokyo) to look around and get me games. First I did take some research on the topic, looking around BGG for some potential games and also contacted Sugorokuya facebook to find out which games available and which they recommend. So based on the research results I gave my girlfriend a list of games with priority order but in the end it’s up to her decision. There are 10 games on that list and I’m gonna spill them here. As you can see, this game was at the top of the list. I really really want this game since last year. It has good theme and yes it looks very Japanese and it was designed by Seiji Kanai. The game has dual language (Japanese – English) which I found it interesting. But rumor has it’s hard to come by, the game is out of stock. I was pushing it for this game a bit, but it’s okay since I did no harm to anyone or anything. Well, just read about this game recently and somehow it has some good review there on Japan. So I decided to take a look. The game dominant color is quite intimidating along with the theme, which is quite manly and not very interesting on women’ / girls’ opinion and taste. The game is quick and like most Japanese games, the core mechanics are bluffing, secret identity and such. Masao Suganuma has been on the spotlight since he designed Machi Koro, in which the game has receiving praise and positive review by gamers around the world. And yes he designed another game called Sukimono. Don’t really know about it but the theme is about collecting precious items or antiques. The visual presentation of the game is stunning and that’s the reason I want it. Too bad it seemed the game is hard to come by. Hisashi Hayashi is not a new designer, we all know his works and he’s also a good one at it. Sail To India is getting a wide release by AEG and while I can get the US edition, the original version does have more value for me. And more of it, the game has a very positive feedback, seems a good choice and heavier game than the rest of the games in the list. 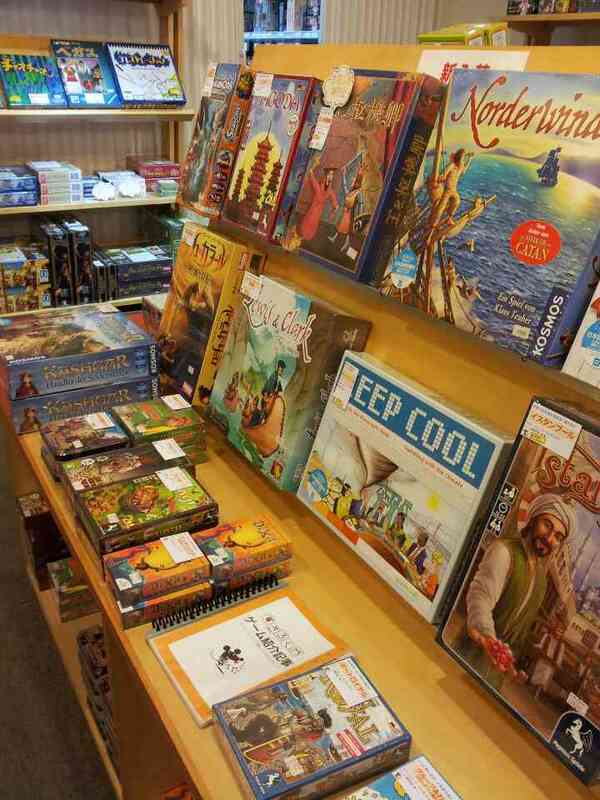 Along with Sail to India, AEG also distributes this game also. The visual presentation really similar like Say Bye to The VIllain but with different theme. It comes in dual language so another plus. I don’t really know about this game, but it looks interesting and has cool-looking hand sketch style art with colorful backgrounds. Also don’t know about this, but looking at the arts, they’re cute and funny. Another Maso Suganuma’s game. Well he’s pretty popular recently, thanks to Machi Koro. Candy Chaser is on of his new games, about collecting points from candies. It really involves bluffing and dice rolling. The game has this unusual dark look but cute illustration, a bit of abstract and it’s language independent. This one caught my attention because the simple art with cute illustrations designed by Jun Sasaki (another potential Japanese designer) and published by Oink games. The game evolves in card bluffing with hand management. Pretty much a simple and quick party game. I don’t say the game is original Japanese, but the Japanese version looks very cute and gorgeous. Really has good collection value and I can see people will be interesting looking and playing it. But in the end my girlfriend bought me 2 games and 1 game for herself. The games are Sail To India, Criminal Dance and Pyjamaparty. The last game is hers. So she bought me number 4 and 6 from the list, too bad the top numbers were not available. I have the Japanese version from Gamefield of Sail to India and Criminal Dance, both of the games are in Japanese and hell I cannot read the rules. Sail to India is easy, I can check the rules from boardgamegeek.com having AEG distributed the English version does make it easier to look. But I couldn’t find anything on boardgamegeek.com for the other game, so still don’t know how to play the game. The game site is on Japanese and they only give short / brief explanation of the game play (even that’s on Japanese that I used Chrome to translate with no satisfying end). Lewis and Clark on sight! … and another recently released games. I’ve managed to create some English paste-ups for Sail to India and sleeved all the cards, so it’s ready to be played anytime soon. Fantasy Flight Games had just recently published it’s new game, based on the famous and out of print Frank Herbert’s Dune combined with the Twilight Imperium universe as it’s background story and theme. 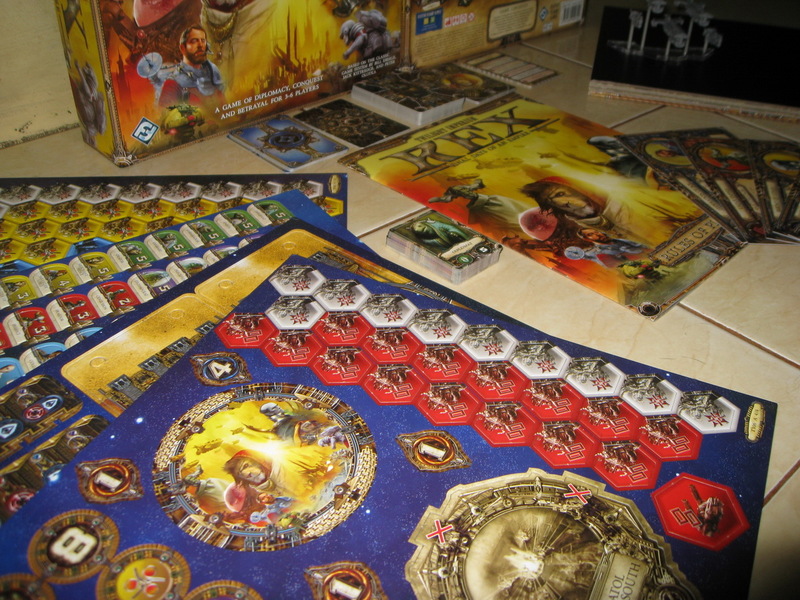 Still using the same mechanics and game system created by Bill Eberle, Jack Kittredge & Peter Olotka, Corey Conieczka and Christian T. Petersen tweaked the game rules and system to created more simplified, streamlined and balanced new game called Twilight Imperium REX: Final Days of An Empire. This re-implement 6 players game has 6 different races to choose to, taken from the Twilight Imperium races which were more likely have the closest resemblance with the original Dune’s races / factions. These 6 races are Jol-Nar which represent Atreides, Letnev represent Harkonnen, Lazax represent Emperor, Sol represent Fremen, Hacan represent Guild and Xxcha represent Bene Gesserit. These races also apply one of the special powers the original races possessed. Unfortunately, mustering troops in the face of an ongoing Sol blockade is difficult at best (unless, of course, you are the Federation of Sol or its faithless ally, the Hacan, who supply the blockading fleet). Savvy leaders must gather support from the local populace, uncover hidden weapon caches, and acquire control over key institutions. Mechanically, this means players must lay claim to areas that provide influence, which is then “spent” to (among other things) smuggle military forces through the orbiting Sol blockade. Those forces will be needed to seize the key areas of the city required to win the game. From the moment the first shot is fired, players must aggressively seek the means by which to turn the conflict to their own advantage. While the great races struggle for supremacy in the power vacuum of a dead emperor, massive Sol warships execute their devastating bombardments of the city below. 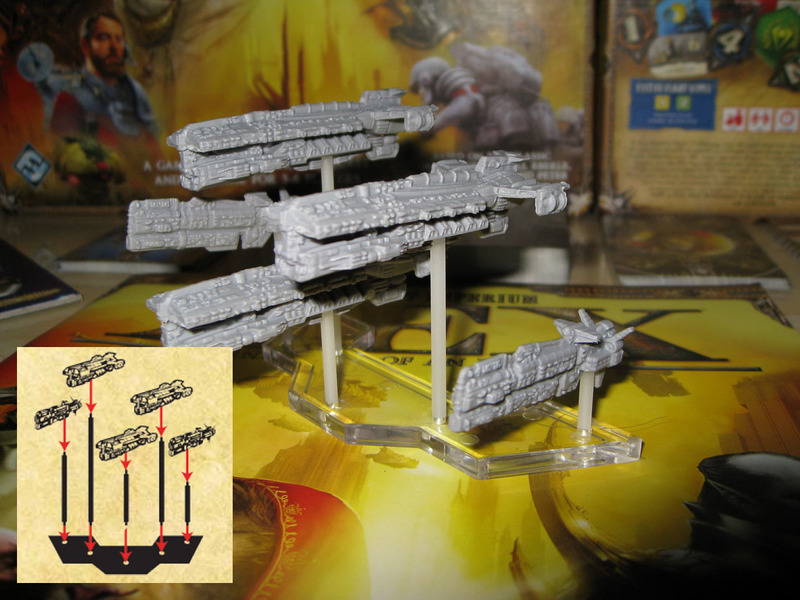 Moving systematically, the Federation of Sol’s fleet of warships wreaks havoc on the planet’s surface, targeting great swaths of the game board with their destructive capabilities. Only the Sol’s own ground forces have forewarning of the fleet’s wrath; all others must seek shelter in the few locations with working defensive shields…or be obliterated in the resulting firestorm. Although open diplomacy and back-door dealmaking can often mitigate the need for bloodshed, direct combat may prove inevitable. When two or more opposing forces occupy the same area, a battle results. Each player’s military strength is based on the sum total of troops he is willing to expend, along with the strength rating of his chosen leader. A faction’s leaders can therefore be vitally important in combat…but beware! One or more of your Leaders may secretly be in the employ of an enemy, and if your forces in combat are commanded by such a traitor, defeat is all but assured. So whether on the field of battle or the floor of the Galactic Council, be careful in whom you place your trust. This time I am going to do a break down overview of the component of this little baby. 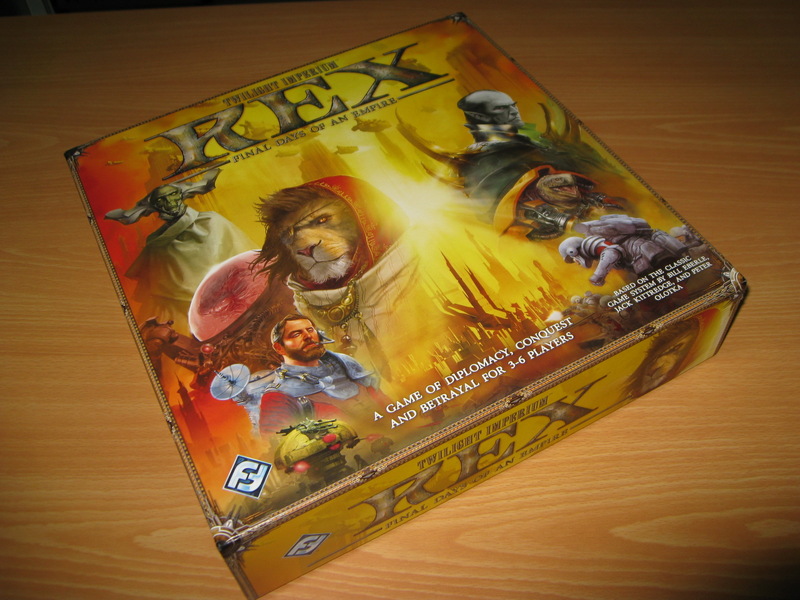 Start from the box and to the rules to make an easier description for other gamers who need information for getting this game. By the look of it, I would say Fantasy Flight Games did it again. Not only they created such a great game, but they also produced extraordinary components one could expect from their games. A simple medium box (Mansion of Madness, Chaos in The Old World size) with great and compelling artwork (yellowish tone colors in all sides), and like their other game boxes, it’s good quality linen finished which is awesome (you can tell by the visible linen texture). It’s quite heavy, 2 kg estimated weight. In the right bottom of the cover you can notice that there is a credit to the original designers of Dune (a good way to show appreciation and also a copyright thing). The lid cover was really fit and tight, it really need effort to uncover it, which has good and bad side. The good is, the game is quite tightly covered and you don’t have to worry that the game might spilled when carried around. The bad is, it’s quite difficult to open it and need extra effort to do so. But I guess, it’s a good thing, since I don’t mind the bad side and really vote the good side of it. Inside the box, you can see the rules on the top with character sheets inside a zip lock bag (perfectly fit) and guess what, a piece of errata, the same one I found in Rune Age. Little bit a let down to have such an imperfect rulebook that you need to perfect it with an errata. But then again, it’s not really minor, only few corrections. Under those thing are the punch boards covered in shrink wrap the board and beneath it there laid the insert tray (thick carton) with miniatures in a baggie and set of cards with 2 sizes. The box dimension is 295x295x70mm. Major components on this game are tiles. These tiles were came from the punch boards (4 punch boards with different set of tiles). The punch boards were sealed together with a shrink wrap. Good thing that they thought over this. So the tiles won’t fall apart while being transported or delivered. This [prove quite a bit annoying in some other cases, with you unboxing a game and you find out that some of the tiles were already fall out of the boards. With a shrink wrap, the tiles are safely and perfectly stay on place. The punch boards are thick enough with linen finished, easy to punch with no left over tear on the print papers. The problem with these thick punch boards, once you punch them all, what will be the fate of them? Straight on the trash can or else? Well, this create another problem with component storage. In the first place, these thick punch boards give the box, depth and perfectly fit. Once they are removed from the box, you will find a gap inside the box which lead into displacement of components inside while handled. I suggest you don’t throw away the used punch boards and place it under the insert tray, to fill in the gap. 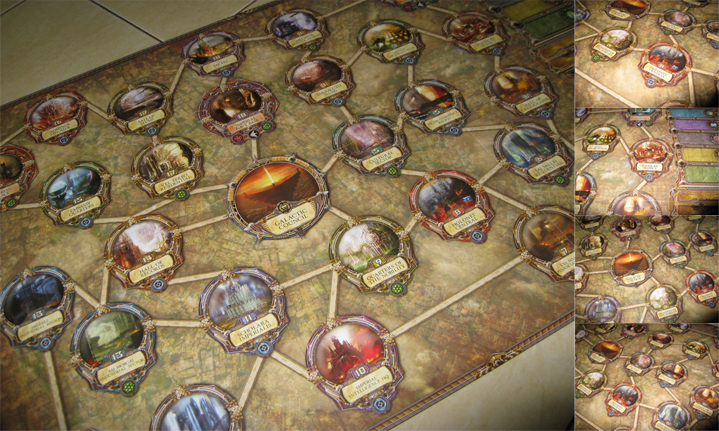 Huge board (Chaos In The Old World size) with 4×2 folds. Linen finished print out with black linen on the other side. Great quality print and artwork. The map shows the places of interest in Mecatol Rex, 28 key spaces with connectors to other spaces. The arts are stunning, but overall it’s look alike the map of Arkham Horror with circular frames around space illustrations. In the right side of the board you can find Influence Pool, Strategy Deck, Influence Deck and Casualty Pool spaces. Nice decision from Fantasy Flight Games for using a ziplock bag to store the board, so it’s stored neatly and easily and also protected from scratch and friction inside the box. You can find the character sheets inside a clear transparent ziplock baggie which perfectly fit the size of the sheet. Quite neat but you need to carefully take the sheet out of the bag, cause it’s very tight. There are 6 character sheet, each represent one of the 6 races available (Lazax, Hacan. Letnex, Sol, Xxcha and Jol-Nar). The front side of the sheet consist of basic information for each race, advantages and setup. The other side contain a background story of each race, very useful to create thematic experience in the game. Players are suggested to read this first too understand their significant role in the theme and the game itself. Well, it’s not a miniature game, so you must well aware that there’s only one (kind of) miniature plastic figure on this game. It’s Sol’s Dreadnaught Fleet, which consist of 5 dreadnoughts assembled into one fleet. It’s unpainted (so you need to paint it if you want to get serious into the theme and story). It’s come with plastic stands to create flying effect while placed on the board. The dreadnoughts were highly detailed sculpted and even though it’s the only miniature, it’s really eye catching. Guaranteed, every eyes will look at your direction just for having this miniature displayed in front of you. Need to spare my time to paint this badass. Now, this make the components quite special. The battle dials are rather unique, by using thick card board as dial and at the right side were placed a slot for leader tiles. This is unique and cool but the downside is that the slots are kinda hard to place the tile on. Which need extra effort and pressure to make it fit right into the slots. There also a problem on how to remove it, for you need another extra effort and energy to pull of loose. This will surely wear of the slot and eventually it will loosen up. By that time, it’s gonna be such a waste of components for not working as they’re supposed to. The leader slots are used for units reinforcement during battle and also a means for using the strategy cards. When I assembled these dials, there was difficulty on applying the plastic connectors through the wheels. Since the hole aren’t the same size with the other hole on the back plates, it’s smaller. So need extra caution when apply more power to pushed it fit. This large circular shape marker from thick board is used as a first player marker. The artwork is quite the same at the cover of the box and it is kinda over sized. But it’s good nevertheless. Though it’s not necessarily important (you can use any other component as marker) but it is a nice addition to the game. Influence is the only currency in this game, and it comes in 3 denominations (1, 2 and 4) with unusual geometrical shape. Each denominations are mark by different color lines (green, yellow and blue) quite a thin line but somehow it’s easy to spot on with the color lines and big number on the center of the token and it’s also double sided. Each race has unit tiles in different colors and each logo on it (hexagonal shaped). Printed double sided to make the application easier to recognized during the game. 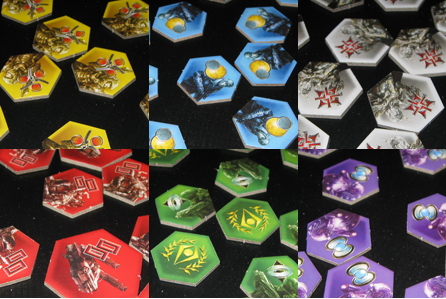 These tiles will often come in and out the board during a game, for these unit tiles represent each race military power. While each race logo is shown, the tiles are color coded to each race, which make it easier. Hacan has yellow color tiles, Jol-Nar is purple, Lazax is red, Xxcha is green, Sol is blue and Letnev is white. Special for Lazax, there are 4 bigger unit tiles which are counted as 2 strength unit each (mechanized). Each race has 5 leader tiles with different title and strength. These tiles are shaped uniquely so they can be placed on the battle dial slots. Each tiles has it’s own name and different strength. Each race also has different set of strength leaders. This ensure variable player powers element in the game. For example, Xxcha’s leader tiles have the same amount of 5 strength, which are easier to guess but this don’t let others easily use the traitor cards on it. 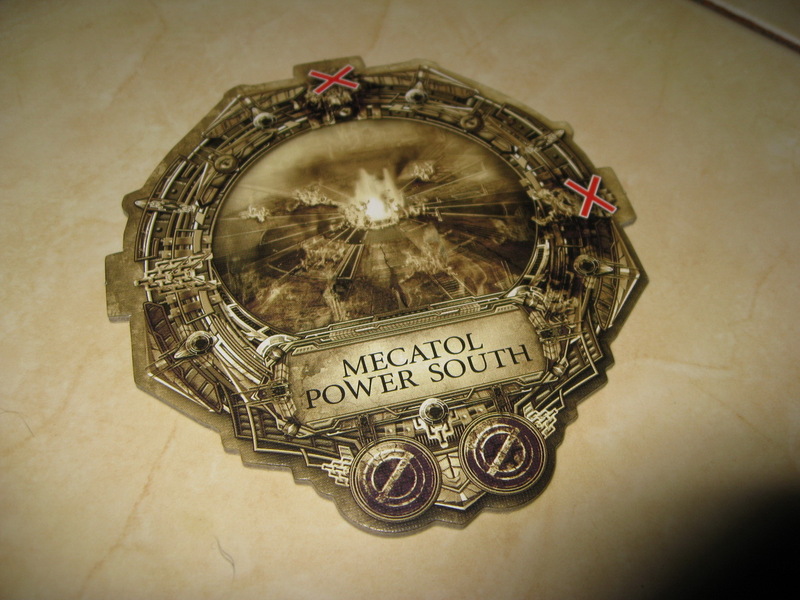 This huge tiles is used only in special circumstance which is when playing with 4 or fewer players to prevent units from entering Mecatol Power South space of the game board. Very nice looking artwork. 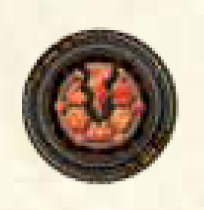 This small circular token is placed on the board by a certain strategy card. While on the board, it negates the presence of a shielded icon. The thing is, this token is so small and being the only one token that doesn’t have companion makes it a bit hard to store. You need extra small bag for storage, which still can be lost. Or if you put it with other tokens, you might also lose it during the game. But, I guess it’s still not a big deal. 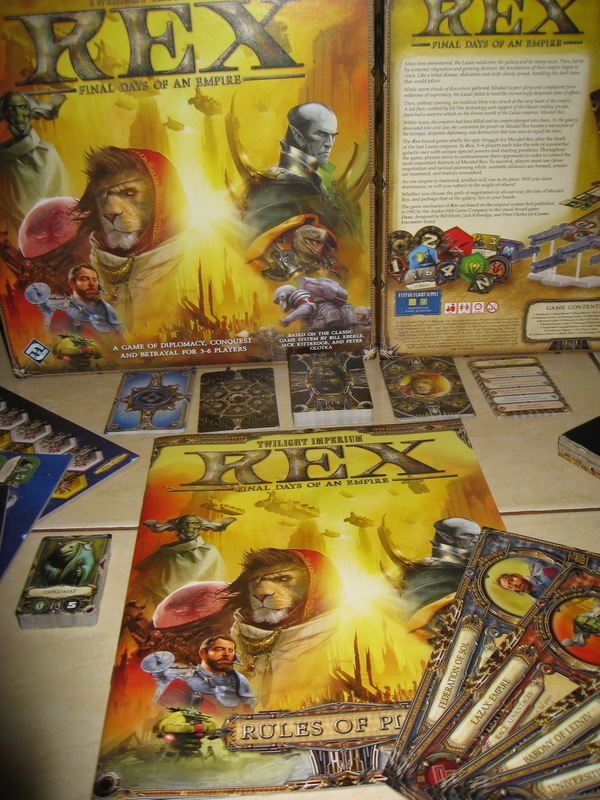 This tokens are used only for Xxcha to predict the game play which also as another means of stealing victory from other race if the prediction was true. 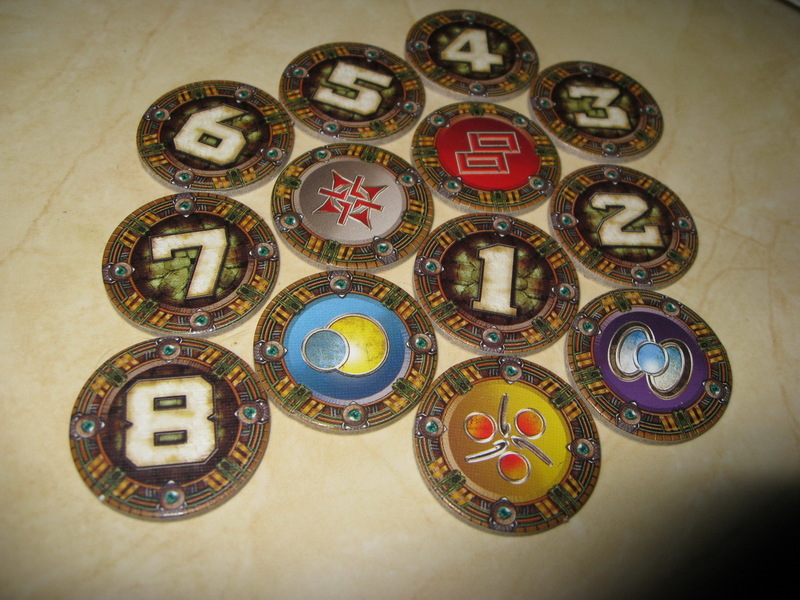 There are 13 tokens, with 5 of them show the 5 race logos and the rest of 8 tokens are numbers based on the game round. 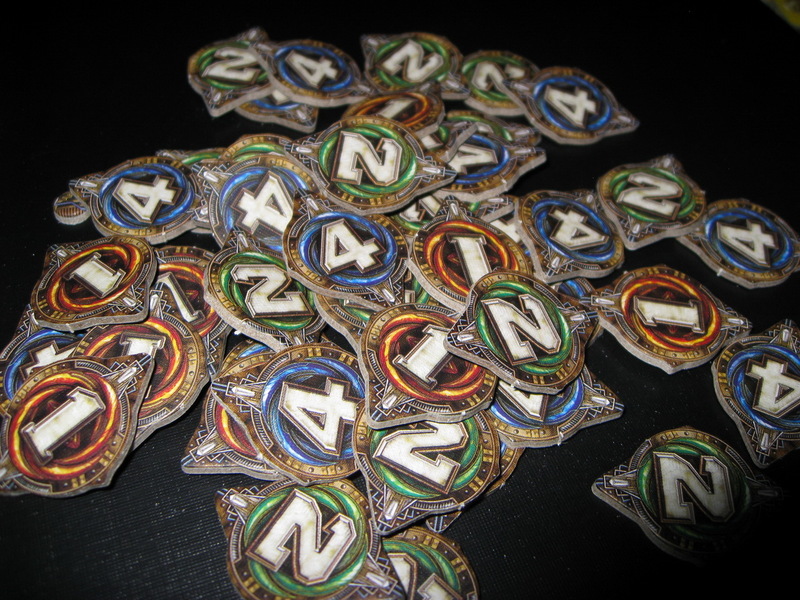 Xxcha player use this tokens to predict who’s gonna win the game and in what round. When the game ends and it’s won by other race, Xxcha player can steal the victory if he’s prediction is shown to be true. What a unique idea and to be honest though it’s hard to predict anything before the game starts, it sure looks fun! The size of these cards is 57.5x89mm (I used Chimera sleeves from Mayday Games) which contains 16 cards. Other than to determine where and how many new influence tokens are generated on the board, it also used to mark the game round (8 rounds). These influence cards has different type of cards, Normal Influence, Temporary Ceasefire (time to form new alliance or break alliance and trade influences) and Sol Offensive cards (while this card is played, The Sol’s Dreadnaught Fleet will move to bombard every locations on it’s route). Sol Offensive card doesn’t count as round marker, since after drawn and resolved it’s effect, the card is discarded and another Influence Card is drawn. 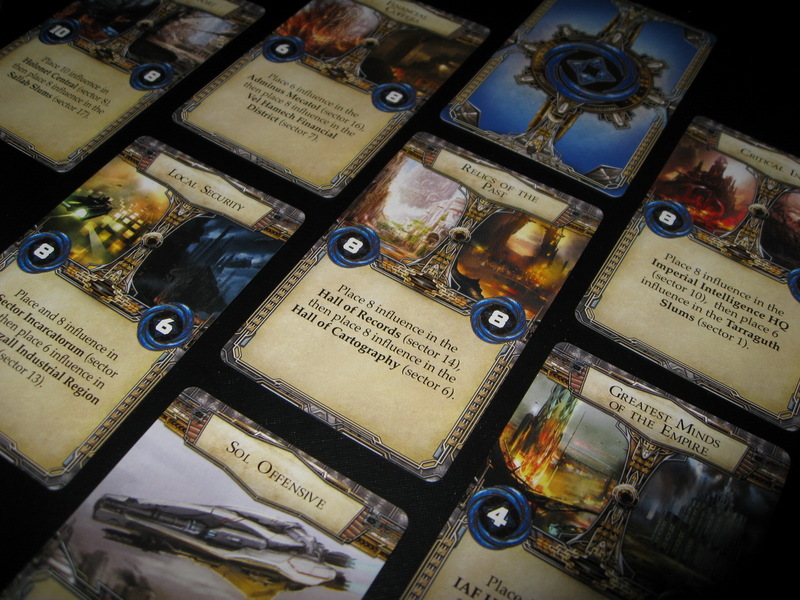 With the same size of the Influence Cards, these cards (42 cards) are played during the bidding phase. Each player will want to get these, since this will help them during the game a lot (especially during battle). At the bidding phase Strategy cards drawn based on the amount of players, and start from the first player, choose the card he wants (Jol-Nar can look at this card first before the bid start due to it’s race advantage) and start the bid with influence. The winner pays the influence to Lazax (due to it’s race advantage) except Lazax must pay the cost to the influence pool. These cards has 3 types, Offensive, Defensive and also Normal Strategy cards. 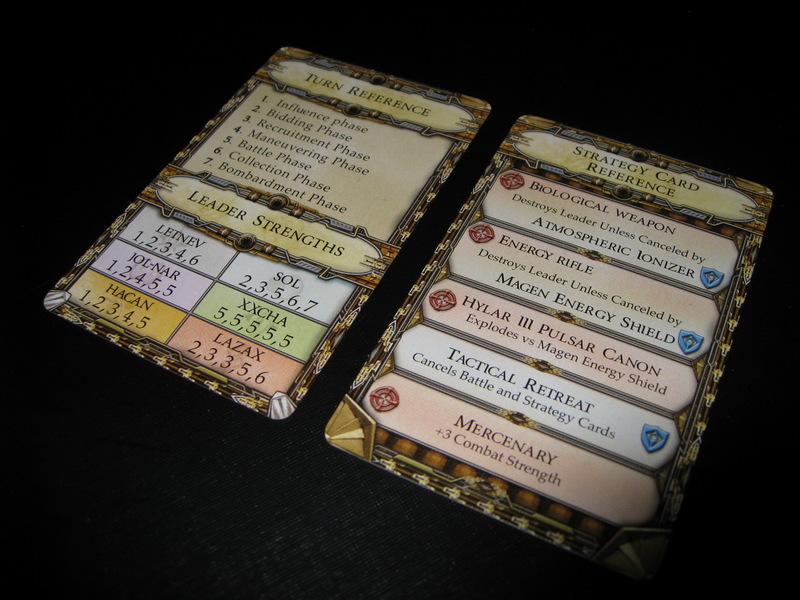 Offensive and Defensive cards are played during battle with the presence of a leader tile attached to one of the battle slots. The Normal cards are used situational mentioned on the texts of the card. 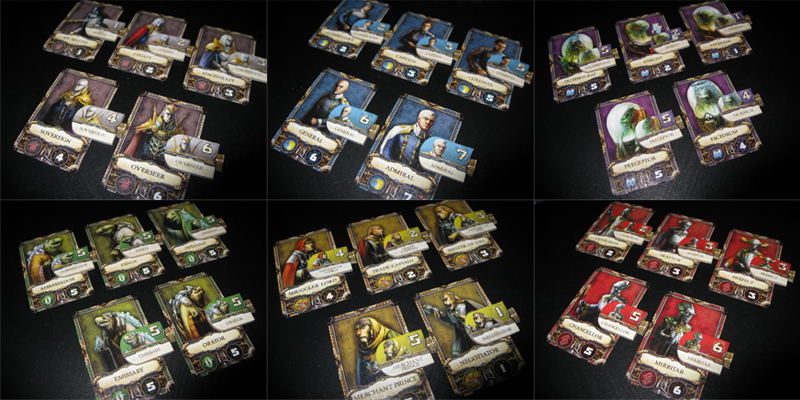 Also with the same size of the Influence Cards, these cards are used to track which players are in an alliance together and provide special abilities to the allied player. Each race has 2 Ally Advantage Cards (total 12 cards), that can be exchanged during the Temporary Ceasefire to form diplomatic relation and alliance with other races. 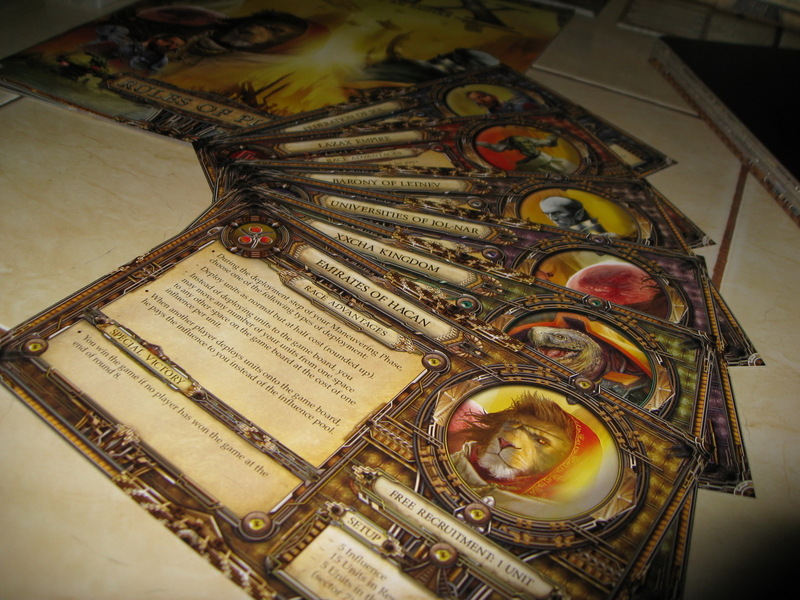 The front side of the card is the text describing the alliance advantage achieved for being an ally to that race and the back side is the illustration of each character’s race. There are 8 Betrayal Cards with the same size of Influence Cards. 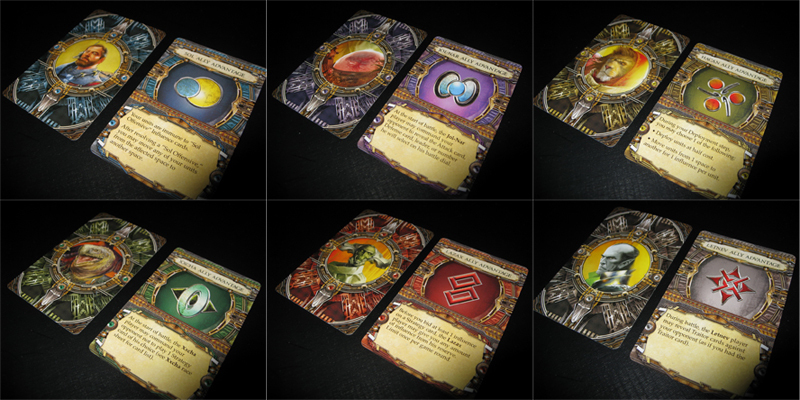 These cards are used to steal victory away from a player’s allies under specific condition mentioned on the card. 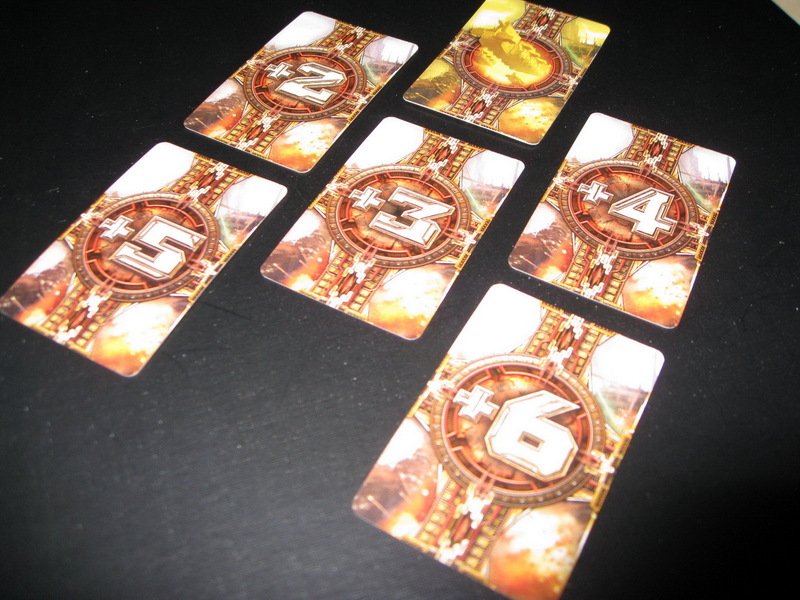 This cards also optional during the game, which comes the variant play into the table. So different game modes to choose is always an interesting idea. Same size as the Influence Cards and each player get one of this to helm them during the game. The 2 sides have different information. The first side has the game round broke down in phases, and there are leader strength list of each race at the bottom. The back side shows the list of which Offensive Strategy Cards and negated by which Defensive Strategy Cards. A very useful during the game, especially the leader strength lists and the Strategy Cards list for new players. The traitor cards (30 cards) has the size of a Mini USA cards which is 41x63mm (Should fit with Mini USA Card Sleeves from Mayday Games). These cards are given 4 for each player randomly and they must choose one and discard the rest (except for Letnev, due to his race advantage, he keeps all the four cards). There is a leader image with it’s corresponding name, race logo and leader strength at the front side of the card. This card is used during battle against that specific race. Of course there is a gambling element to guess which leader your opponent is gonna use, but it;s better than nothing. Another innovative idea which I don’t know if this was used in Dune or not. 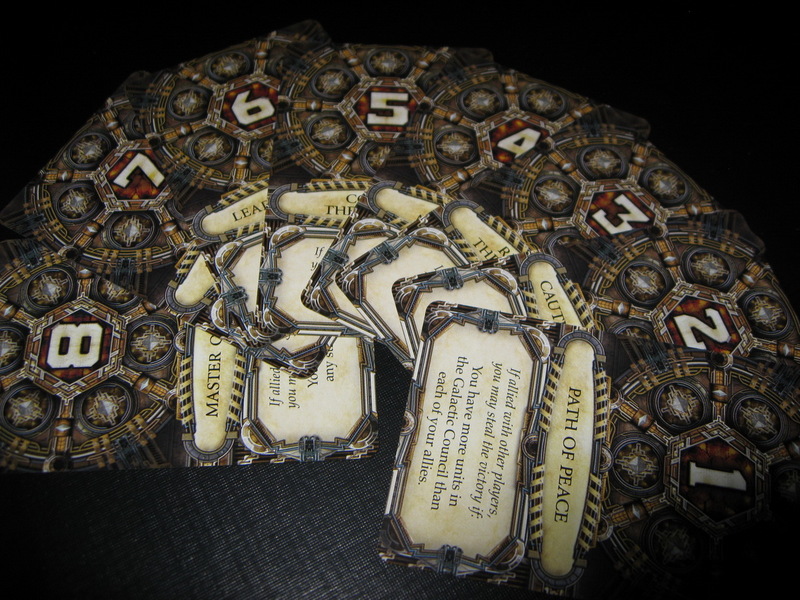 With the same size as the Traitor Cards, these cards (6 cards) are used only by Sol player, to determine the movement spaces of the Dreadnought Fleet during Sol Offensive. Which Sol’s race advantage is to look upon the next bombardment card before the round begins and also, Sol units are not affected by the bombardment. The value of the cards are range from +1 to +6. Fantasy Flight Games always provide their games with stunning rulebook. Mostly known as Ameritrash games developer, they create comprehensive rulebook (even this mean thick rulebook and heavily barred with texts) to support the game play. 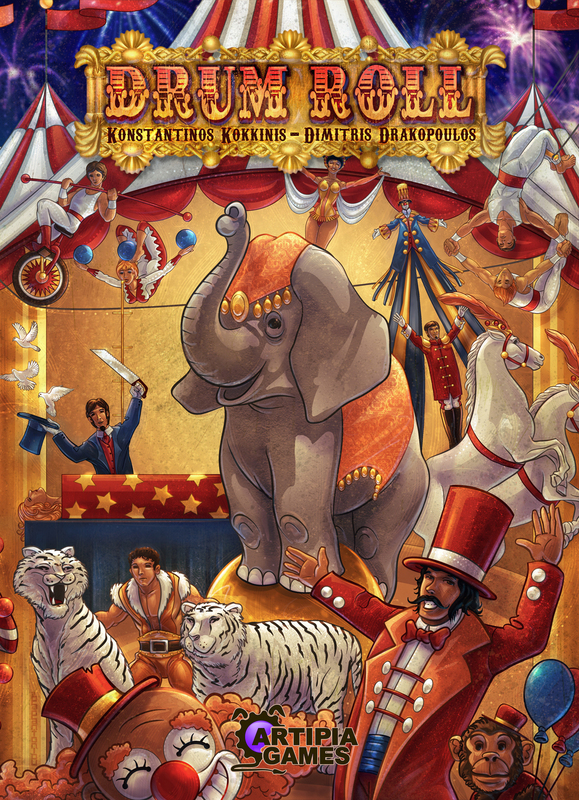 And their rulebooks are great visually with stunning thematic artworks and layout designs. 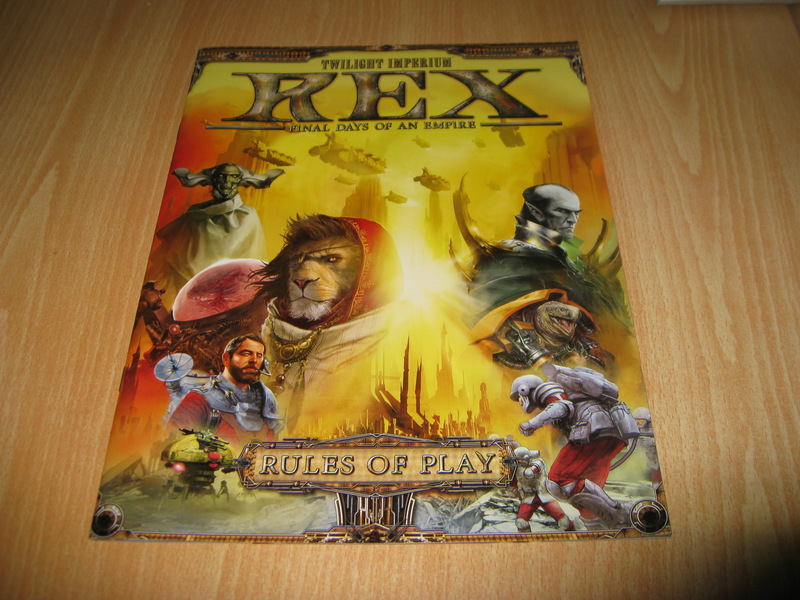 This one is no exception, a top notch, 32 full colored pages of rules with 210x280mm dimension, but they screwed up with the existence of the errata. Overall, I valued the game components. All the components are in great quality, a benchmark for other publishers to give a chrome presentation to their games. I have one word, SATISFIED. Great job guys! Well, today is 21st February 2012. In the middle of Tuesday morning and just caught with all the things i had recently. Looking through my record of plays (Board Games of course), which led me to think that being a game that I played a lot, 7 Wonders did a significant effort to be placed on top, right in front of Rune Age. Come to think of it, looking at the statistic it was quite a numerable gap with 5 plays differences. They’re different games, though basically rooting from the same card game material. But mostly when you compare those two, you’ll get lot of differences, with 7 Wonders being a card game with card drafting mechanic, while Rune Age is deck building. 7 Wonders is played up to 7 players, with a civilization theme and unique game play though lack of direct confrontations / interactions. Meanwhile, Rune Age has a bit of fantasy theme and also 4 different races with special abilities and powers, 4 different scenarios for game play variant, it works well with 1-4 players. Each scenarios gives different feeling to the game and less luck than 7 Wonders. Maybe one of the simple reason that why both of those games are in the top of my played list is they play quick (with 30-60 minutes per game). This can really boost the amount of plays. You can play 2-4 games in a row. There are something to think about, I have 7 Wonders way before I have Rune Age and this make 7 Wonders has more advantage time to be played than Rune Age, but I also regard that I haven’t play 7 Wonders quite a long time, first day of the year (new year), played it 3 times. 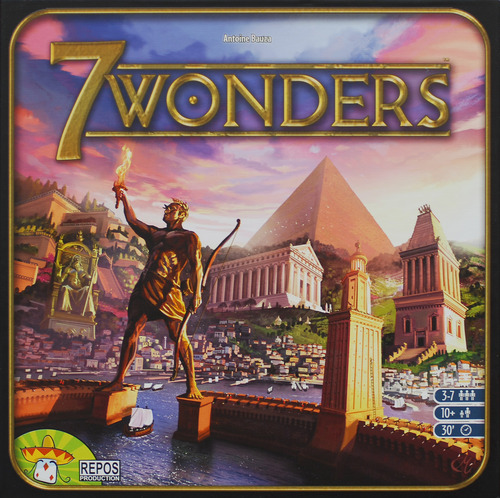 There is no doubt that 7 Wonders is easily one of the best simple, attractive and outstanding filler game, but my gaming groups might as well as kinda grow weary with it, that’s the reason it’s seldom hit the table anymore. While for Rune Age, I played it last week with 3 players and I still liked it. But when playing with new players, I have my own considerations. 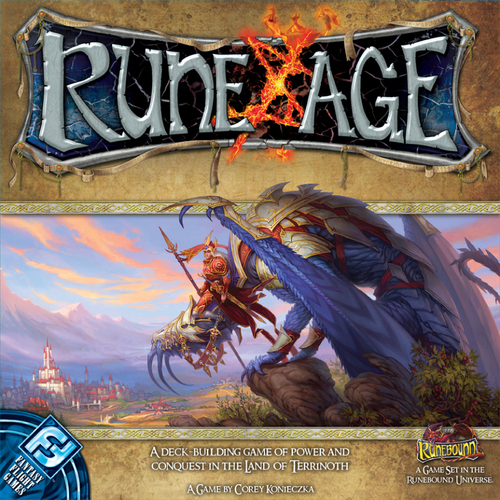 Rune Age rule is simpler to teach and not really fiddly but, most common people (new players) somewhat well off unaware about the strength of the theme influence on the game, which is most likely set an unabridged gap for me to teach the game. 7 Wonders is different, though I might as well as get a bottle of water ready after the explanation, the rules is streamlined and easy to comprehend by new players. Though the only obstacle for newbie is get to know the icons. More thorough and clear explanations are needed and this means 15 minutes minimum game explanation at your doorstep exclude the questions afterwards. Okay, lets now look the rest of the list. Unsurprisingly Martian Dice is on the 3rd place with 17 plays. Looking by the nature of the game, it’s acceptable. Quick and easy, though has totally different feeling. Right below it, is the famous Agricola, which came to my surprise, since it’s a long and fiddly game (2-3 hours), I even played this one 4 hours long (oh that cruciating pain). 12 plays are marvelous, I didn’t even realize and remember. 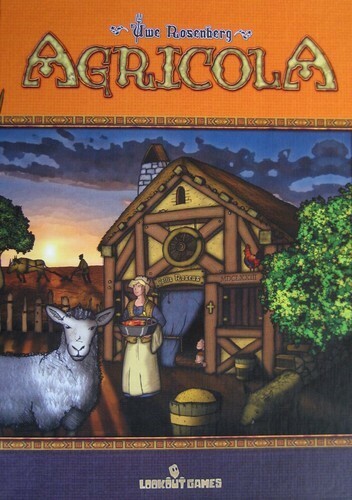 Agricola is one of the game that requires you to enjoy the game flow (at least for me). One does not simply over think the victory from the beginning of the game. Once you enjoy the game flow, you will realize how jewel the game is. Very suitable to play this with close friends or family, enjoy the evening and of course play through it with some snacks. Don’t you agree? Akrham Horror and Balloon Cup stay right behind with also 12 plays. What can I say, Arkham Horror is epic and though it’s leaning down to the dull curve, I still wanna play this if I have the chance (oh that memorable times). On the other hand, Balloon Cup was a black horse, never thought this kind of 2 players filler got my attention. Quick and easy with small table space gives you more reason to play this one. Now with 11 plays, If Wishes Were Fishes and Quarriors, two games that Quarriors being one of the games that I don’t have. It’s one of my friend’s and he lent me for quite a while. So what’s interesting with these two games? If Wishes Were Fishes is one of my earlier games, bought it just because of the components (quoting from my review of the game “Who doesn’t like gummy worms?”. Too bad lately it’s unfairly rarely hit the table and come to think of it, maybe I need to bring it to the table next time. Now, Quarriors is an interesting dice game, with innovative and unique mechanic which brought the game to it’s fame. Quick, simple, easy and very interesting for kids, though the theme is kinda less prowess in the stand of time. 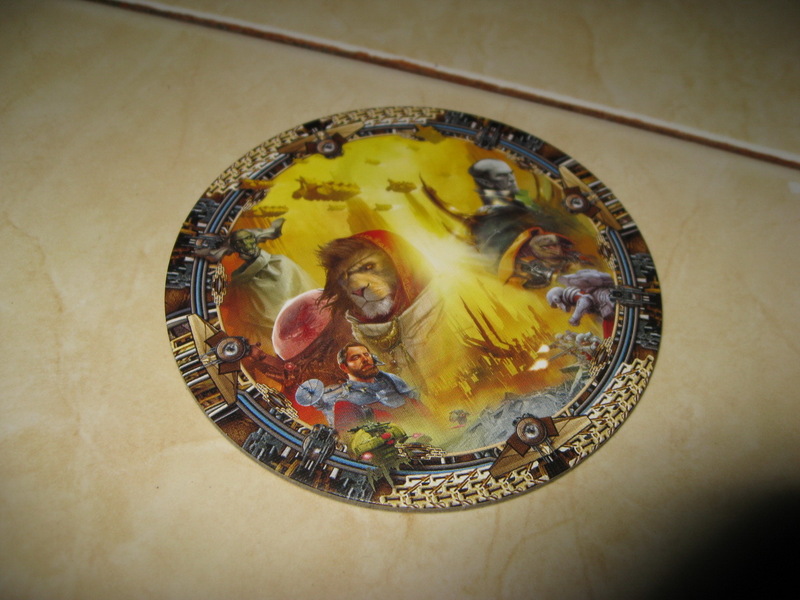 I found that to explain this game, it’s easier with a player mat which then I made custom player mats. The bad about this game is, sometimes players will be able to tell the winner just by looking at the possibility, which makes the game quite a bit anti-climax. 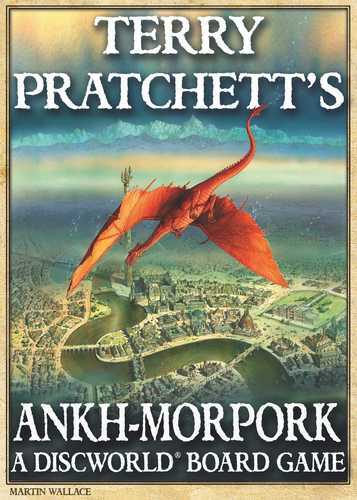 After those two, Discworld: Ankh Morpork and Thunderstone are right behind with 10 plays. I am optimistic about Ankh Morpork, to climb the ladder with a serious pace, since my girl and me like this game so much. It’s chaotic and suspicious feeling really shoot you to the gut. Entertaining, full of laughter and of course this kind of game need a perfect gaming group. So, let see where this one stand in the near future. Unlike Aknh Morpork, Thunderstone has been quite a jobless game, and I am in deep concern. Since the existence of Rune Age, Thunderstone just couldn’t get out from the shadows cast by Rune Age, with similar mechanic, Thunderstone was beaten from several aspects such as the setup, the fiddly rules, the less interactions and no scenarios. Even nowadays there are lot of variants on the forum, but it seemed Rune Age won outstandingly. Plan to play it again in the near future. Just hold on Thunderstone! Drum Roll, Pickomino and The Resistance follow with 9 plays. While Pickomino is a simple mathy game of dice for kids but some of my friends and me found this game to be hilariously fun. But for some reason it’s just seasonal. Not in my collection and never play it again since it’s returned to it’s rightful owner. Drum Roll in the other hand, has the same mathy feeling though heavier with the salary aspects. Great game, a bit of overwhelming but suit me right into it, great artworks importantly. This one will surely still climbing it’s way in this list. The Resistance is kinda end up in an unfortunate situation, which most players in my central gaming group just rather feel enough of this one. To make the case worse, it really shines with lot of players and with specific gaming group. But nevertheless, always look forward for a session and resistance is futile. The rest of the list are being end up in the bottom, though I won’t say they’re bad or not good. They just circumstantial not in the best position to begin with. Lack of times, no perfect gaming group that are willing, no chance and other hundreds of reasons. Instead some of them I am hoping to get them played more often like as Caylus, Chaos in The Old World, Troyes, War of The Ring, Brass and many others. By looking at my board games collection growth, I just wish that i could be able to fairly divide the playing proportion for each game. There are quite many games in my list to be seriously played for their flying time. 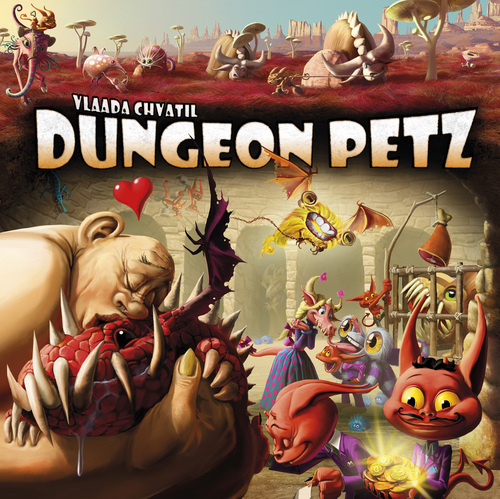 New games like Dungeon Petz, Belfort, Panic Station, Conquest of Nerath and more of it the upcoming game of Eclipse (this should be EPIC) that I back ordered recently. Bandung, 12 Juli 2011 – Game developer Agate Studio dan Kummara akan menggelar sebuah event bernama Indonesia Bermain pada 22 dan 23 Oktober 2011 di Sasana Budaya Ganesha, Bandung. Road Play, sebutan road show Indonesia Bermain melibatkan enam kota besar di Indonesia yaitu Semarang pada 13 Juli, Solo 14 Juli, Yogyakarta 15 Juli, Surabaya 21 Juli, Bandung 23 Juli dan Jakarta 30 Juli. Acara yang didukung oleh Nokia Indonesia ini dirancang untuk kembali menghadirkan bermain sebagai sebuah aktivitas penting dan bernilai positif. “Indonesia Bermain juga akan menampilkan potensi besar dari semua jenis media permainan digital dan konvensional baik sebagai produk, maupun sebagai media kreatif bernilai tinggi,” jelas Eko Nugroho, salah satu inisiator Indonesia Bermain. Mengangkat semangat berbagi positive gaming dalam kehidupan sehari-hari, Road Play Indonesia Bermain akan diisi talk show ringan dari Eko Nugroho, inisiator Indonesia Bermain, Narenda Wicaksono Developer Marketing Manager Nokia Indonesia, dan perwakilan dari komunitas di tiap kota. Selain itu ada info kompetisi ide game, dan tentu saja sesi bermain permainan digital dari Agate Studio dan board game dari Kummara. Bermain pada dasarnya adalah sebuah aktivitas yang mengingatkan kita semua bahwa kegembiraan bisa kita hadirkan dan bisa kita bagikan di mana saja, kapan saja, dan untuk semua. Lewat bermain kita bisa hadirkan kegembiraan dalam belajar, bekerja, berusaha, dan berbagai hal lainnya. “Bayangkan jika kita bisa menikmati segala aktivitas keseharian kita sebagaimana kita menikmati bermain, banyak hal akan bisa kita capai dengan optimal,” tutup Eko antusias. Hal itu adalah salah satu pesan yang ingin disampaikan Indonesia Bermain. Acara utama Indonesia Bermain akan berisi playground, exhibition, conference, creative performance, dan game serta idea game competition. Silakan follow mereka di Twitter @IDbermain atau kunjungi http://www.indonesiabermain.com untuk mendapatkan informasi lengkap mengenai Indonesia Bermain. Indonesia Bermain, when playing is good for your life! Agate Studio adalah sebuah game developer company yang berbasis di Bandung, Jawa Barat. Didirikan pada tahun 2009, perusahaan ini berkembang pesat dan telah menjadi salah satu game developer terbaik di Indonesia. Motto perusahaan ini adalah, “Live the fun way!” dengan keyakinan bahwa kehidupan akan lebih baik ketika ada kegembiraan di sana; games adalah salah satu sarana untuk mencapai kegembiraan tersebut. Agate Studio telah menciptakan lebih dari 80 games, dengan berbagai platform dan beragam tujuan. Kummara Creative Studio adalah developer sekaligus publisher seri Board Game Indonesia (BoardGameID) dalam bentuk konvensional dan digital. Saat ini tercatat ada lebih dari 12 judul Board Game Indonesia yang telah dirilis Kummara. Kummara juga merupakan pionir dalam pemanfaatan board game sebagai media kreatif baru. Selain sebagai sebuah media permainan yang sangat menarik, beberapa board game Kummara juga telah digunakan sebagai media pembelajaran, advertising, serta souvernir kreatif. Road show Indonesia Bermain akan berisi talk show, sesi bermain, dan pengumuman lomba. Kamu juga bisa ikuti perkembangannya lewat Twitter dengan hashtags #RoadPlay.